Heat oven to 300°F. Line 12 regular-size muffin cups with paper baking cups. In medium bowl, mix crust ingredients. Press about 1 tablespoon crust mixture into bottom of each lined muffin cup. In medium bowl, beat cream cheese with electric mixer on medium speed until smooth. Add 1/3 cup sugar and the egg. Beat on medium speed about 2 minutes or until smooth. Add yogurt and cornstarch. Beat on low speed until smooth. Spoon about 3 tablespoons batter into each muffin cup. Bake 20 to 25 minutes or until edges are firm and center is jiggly. Turn off oven; cool in oven 30 minutes with door closed. Remove from oven to cooling rack; cool at room temperature 30 minutes. Cover; refrigerate at least 3 hours. Remove from muffin pans. Top cheesecakes with fresh fruit. In small microwavable bowl, microwave chocolate chips uncovered on High 30 to 60 seconds, stirring every 15 seconds, until melted and smooth. Drizzle over fruit. 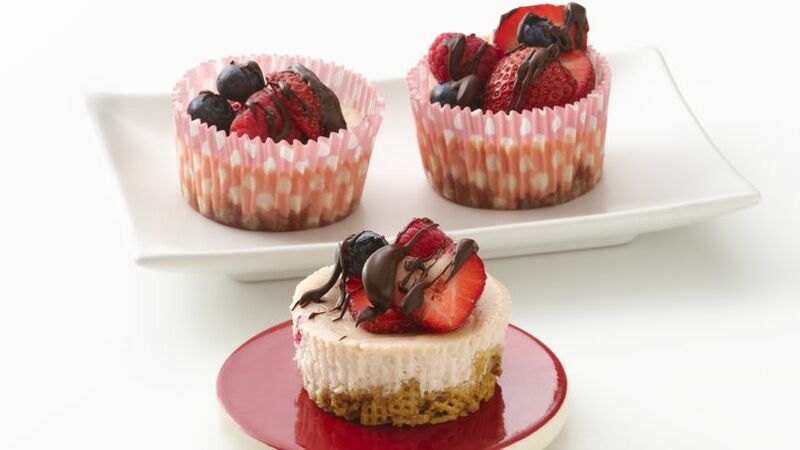 Make these cheesecakes (without the Topping) up to 1 month ahead of time and freeze in a labeled airtight container. About 3 hours before serving, place covered cheesecakes in refrigerator to thaw. Add the Topping just before serving. Imagine these berry cheesecakes on your next dessert tray! Showstoppers this easy are what everyone needs.